Last year at IBC 2017, the Masstech Innovations moniker debuted following the merger of SGL and Masstech. One year later, the fruits of that merger are becoming apparent. Both companies’ flagship products, SGL’s FlashNet software-defined storage and Masstech’s MassStore engine, are now under the same portfolio. 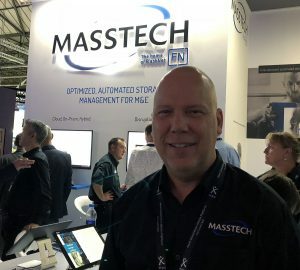 With the merger process completed, Masstech Innovations hit IBC 2018 with plenty of momentum, including the announcement that Fox Sports Mexico recently replaced its Oracle Diva archive-management system with a FlashNet content-storage–management system. During the show, SVG sat down with CTO Mike Palmer to discuss the converged product line following the merger, the demos and themes on hand at its IBC booth, the M&E industry’s accelerating migration to the cloud and object-based storage, and how demand is shifting from vertical solutions to best-of-breed systems. What is Masstech Innovations showcasing this year at IBC? The main message for us at the show is, we don’t sell hardware. Most of the storage-management companies are linked to a hardware manufacturer or a service provider, so they naturally tend to steer their solutions in those directions. But we are truly software-defined storage, and our position is one of trusted adviser to our customers. They can bring a problem to us. We can talk to them about it, find out what their needs are, and then guide them into the correct storage and the correct workflow to put on top of it. To support the software-defined-storage message, we’re showing integration with multiple clouds. For the second show in a row, all of our demos are in the cloud. In this case, it’s in Amazon with all of our storage in Amazon S3. Our customers want to be able to run FlashNet and Masstech [systems] on-premises, in the cloud, or in a hybrid environment. And we can serve all three because we are totally agnostic. It’s been more than a year now since Masstech and SGL merged. How have the two product portfolios come together as a unified offering? The big message for that is, the SGL FlashNet brand and the Masstech MassStore brands live on. The FlashNet brand signifies software-defined storage, and the MassStore brand signifies sophisticated workflows, transcode engines, and things like that. And they work together. We can put the advanced transcoding workflows on top of the software-defined storage and create some amazing [synergy]. That’s the direction that we’ve had for the past nine months or so as a result of the merger, and it’s really been like finding lost family. It doesn’t happen that way very often in mergers. Are you seeing increased interest in object-based storage? If so, how are Masstech’s solutions catering to this shift? The shortcoming with cloud vendors and most people who are doing object storage right now is that the metadata that you can give them is defined by the storage-vendor schema. So it’s a very narrow set of metadata that you can provide. We’re working around that. We accept larger schemas from people. We’ll do customized schemas: whatever you want to put in there, we will store with the object. Now, a lot of vendors say that, but is it really stored with the object? No, it’s not. It is stored in a database that runs alongside the storage, and then your media is stored in the deep storage. The metadata is not stored in the deep-storage media, whether that be in the cloud or on LTO. If you lose that database, then you are in serious trouble. There was plenty of talk of media companies’ moving their entire libraries to the cloud in recent years, but it seems that most organizations are now adopting a hybrid on-premises/cloud model. Would you agree? If so, how is Masstech serving these hybrid environments? My quote for the show is that cloud is not the answer to every question. It is definitely to some, but certainly not to all customers. Before you can tell a customer the cloud is the answer, you have to sit down and find out what they’re doing. Some customers that are doing episodic content, movies, things like that, need to spin something up, produce it, keep the content for two years, and then it all goes away. They don’t need to make capital purchases for that. Their total spin is going to be less than the capital cost of a storage system if they’re putting it into the cloud. So we say absolutely do that. But a news or sports [customer] usually has 10 years’ worth of content they want to move into the cloud and continue feeding on a daily basis. That content is very low value on average: 90%, 95% of it’s not going to be used. You look at the cost to go fully cloud, and it’s immediately more expensive than LTO storage locally. So for that customer, rather than telling them what to do, we would say, “Here are the numbers. We will do whatever you want us to do.” That’s the type of thing we’re doing with our customers. We want to be a trusted partner with them to give them the straight scoop on what they need to do. And what about users that want to use multiple cloud platforms? Many customers want to go across multiple clouds because different clouds have different values at different times. That’s one of the things we can do: we can move the content between clouds so it always ends up in the storage tier that’s most efficient for whatever point in that object’s lifecycle it is. People are really excited about Amazon Lifecycle Management, which is a great [tool]. But we’re the lifecycle that works across multiple clouds. What do you foresee for the industry in the year ahead, and what can we expect from Masstech Innovations at NAB 2019? There has been an oscillation cycle between the customer’s asking for a vertical system and then wants a best-of-breed integrated system. Now we’ve switched to best-of-breed integrated. Three years ago, it was definitely vertical, especially as they weren’t as familiar and comfortable with the cloud. Now it seems to be coming back around to best-of-breed, where they want to build their own system from scratch. In terms of what you can expect from us, you will see federated search from Masstech at NAB, which has been the holy grail of a lot of MAM systems. You can have 50 different sites with 50 different instances of your storage on it and be able to search all those with one search and retrieve it. Look for that coming soon.